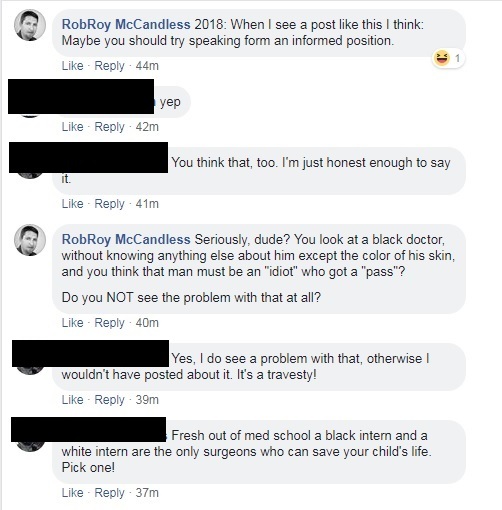 I was shocked today when an online friend made a blatantly racist statement about black doctors. I was even more shocked when he claimed I held the same beliefs, and simply wasn’t honest about it. I know racism exists, and I know that in the Trump Era its been allowed to come out from under the dark stones where it festered and rotted, into the sunlight to openly march. Whether or not Trump is a racist hardly matters anymore. His failure to immediately openly decry the associations with White Supremacists, and handwave away their bigotry was all the fertilizer they needed. But I’ve never faced it so blatantly. I’m a white male who grew up in a relatively middle-class suburb. Being an American from the West, I’m also a bit naive about the evils of the world. So shell-shocked barely begins to describe the sensation when I was told, pointblank, “You think that, too. I’m just honest enough to say it.” That’s where, in retrospect, I drew the line. I couldn’t have consciously made the decision right then. I had the sensation of a poodle who’d been struck with a ball-peen hammer. I’ve never had such a blatant disregard for basic human rights directed at me. Again, naïve, but I’m aware of it, and actively work against it. 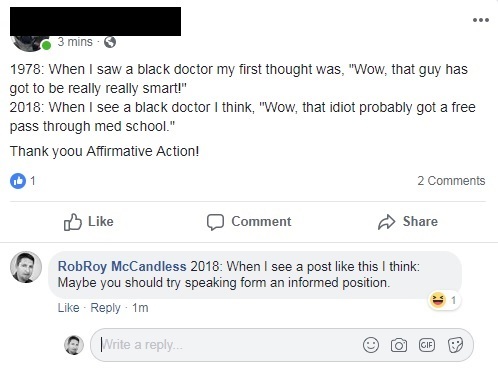 I’m sorry [Redacted], I like you, I've enjoyed engaging with you and exploring your point of view but you’re far too intelligent for me to overlook such blatant racism. I'll admit I'mm shocked that someone who holds this country in such high esteem—the Land of the Free—would ever want to take away any kind of freedom based on skin color alone. You might laugh this off, let it feed into your narrative and reinforce your stance—but you really shouldn’t. It’s my hope (small, but still there) that this lost connection serves as a real wake-up call, and it should underline in bold red the fact that I DO NOT hold with your racism. I stand opposed to it so much that I would rather not be your friend. Wrong is wrong, and racism is always wrong. It’s great that you’re a Christian, because that means there’s still a chance for you to follow Jesus’ teachings: “Stop judging by mere appearances, but instead judge correctly.” (John 7:24) You should be the first one in line to accept people for who they are, not how they appear, nor to judge them based on preconceived notions before you ever meet them. The idea that, based on a single physical attribute alone, you can determine the worth of, and discredit someone, without knowing anything else about them is completely antithetical to the Christian ethos. I hope that you eventually come to realize how disturbing this is, and if you ever do, feel free to friend me again. It always to get the rude wake-up call that people you've always liked hold abhorrent beliefs. On the plus side, that Maya Angelou quote might be the most inspiring thing I've read all year. Thank you, Rob! Thank you for every word.